This year, Zulhijjah begins on the 16th or 17th October 2012. The Prophet (saw) said: “There are no days in which righteous deeds are more beloved to Allah, than these ten days. One fast during these ten days is equal to the fasting of one complete year, and the worship of one night during this period is equal to the worship in the Lailatul-Qadr.” (Tirmizi). Let us learn more about these blessed 10 days! Praise be to Allah who has created time and made some times better than others. Some months and days and nights are better than others, when rewards are multiplied many times, as a mercy towards His servants. This encourages them to do more righteous deeds and makes them more eager to worship Him, so that the Muslim renews his efforts to gain a greater share of reward, and to prepare himself for death in readiness for the Day of Judgement. This season of worship brings many benefits, such as the opportunity to correct one’s faults and make up for any shortcomings or anything that one might have missed. Every one of these special occasions involves some kind of worship through which the servants may draw closer to Allah, and some kind of blessing through which Allah bestows His favour and mercy upon whomsoever He will. The happy person is the one who makes the most of these special months, days and hours. He draws nearer to his Lord during these times through acts of worship. He will most likely be touched by the blessing of Allah and will feel the joy of knowing that he is safe from the flames of Hell. (2) Allah swears an oath by them, and swearing an oath by something is indicative of its importance and great benefit. Allah says in the Quran, “…by the dawn; by the ten nights” (Surah Al-Fajr 89: 1-2). This refers to the first ten days of Zulhijjah. These ten days include Yawm ‘Arafah (the Day of ‘Arafah, 9th Zulhijjah), on which Allah perfected His Religion. Fasting on this day will remove the sins of two years. These days also include Yawm al-Nahar (the Day of Sacrifice, 10th Zulhijjah), the greatest day of the entire year and the greatest day of Hajj, which combines acts of worship in a way unlike any other day. (1) Fasting the first nine days, especially on the 9th of Zulhijjah (Day of Arafah). The mother of the believers, Hafsah (ra) reports that Rasulullah (saw) used to fast the first nine days of Zulhijjah. For those not performing hajj, it is desirable to fast on this day according to their own lunar calendar dates of their own country. According to a hadith, the fast of this day becomes a cause, hopefully so, of forgiveness for sins committed for two years (the year before, and the year after). (2) Zikir. It is Sunnah to say Takbeer (“Allahu Akbar”), Tahmeed (“Alhamdu Lillaah”), Tahlil (“La ilaha ill-Allah”) and Tasbeeh (“Subhan Allah”) during the first ten days of Zulhijjah, and to say it loudly in the mosque, the home, the street and every place where it is permitted to remember Allah and mention His name out loud, as an act of worship and as a proclamation of the greatness of Allah, may He be exalted. Choose a high-quality animal, fatten it, spend money for the sake of Allah. It is the tradition of Prophet Ibrahim (as) and a strongly recommended Sunnah. A lamb, sheep, goat , cow, buffalo, or camel can be offered as the sacrifice. There are seven shares in a cow, buffalo and camel. The sacrifice should be accomplished by slaughtering the animal after Salaat-al-Eid. The sacrifice also called Udhiyah or Qurbani lasts for four days from 10th Zulhijjah until the sunset of 13th Zulhijjah. The meat should be divided into three shares: one for the family, the second for relatives and friend and the third share is for the poor and the needy. Or all of the meat can be given to the needy, if that is needed in the area you are doing the sacrifice. Whoever needs to remove some hair, nails, etc. because it is harming him, such as having a broken nail or a wound in a site where there is hair, should do so, and there is nothing wrong with that. There is nothing wrong with men or women washing their heads during the first ten days of Zulhijjah, because the Prophet (saw) only forbade cutting the hair, not washing it. The wisdom behind this prohibition of the one who wants to offer a sacrifice from cutting his hair etc, is so that he may resemble those in ihram in some aspect of the rituals performed, and so that he may draw closer to Allah by offering the sacrifice. If a person has cut his hair or nails during the first ten days of Zulhijjah because he was not planning to offer a sacrifice, then he decides later, during the ten days, to offer a sacrifice, then he must refrain from cutting his hair and nails from the moment he makes this decision. This prohibition appears to apply only to the one who is offering the sacrifice, not to his wife and children, unless any of them is offering a sacrifice in his or her own right, because the Prophet (saw) used to sacrificed “on behalf of the family of Muhammad,” but there are no reports that say he forbade them to cut their hair or nails at that time. (6) Sincere repentance. One of the most important things to do during these ten days is to repent sincerely to Allah and to give up all kinds of disobedience and sin. Repentance means coming back to Allah and foregoing all the deeds, open and secret, that He dislikes, out of regret for what has passed, giving it up immediately and being determined never to return to it, but to adhere firmly to the Truth by doing what Allah loves. If a Muslim commits a sin, he must hasten to repent at once, without delay, firstly because he does not know when he will die, and secondly because one evil deed leads to another. Repentance at special times is very important because in most cases people’s thought turn towards worship at these times, and they are keen to do good, which leads to them recognizing their sins and feeling regret for the past. The 9th day of Zulhijjah is called ‘Yawmul Arafah’ (The Day of ‘Arafah). 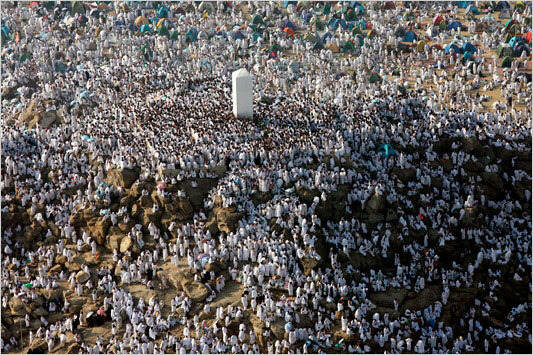 This is the date when the Hujjaj ( pilgrims) assemble on the plain of ‘Arafat, six miles away from Makkah al-Mukarramah, where they perform the most essential part of the prescribed duties of hajj, namely, the ‘Wuqoof of Arafat (the stay in ‘Arafat)’. Whether one is performing salah with Jama’ah (collectively) or on one’s own (individually) makes no difference, one should recite the Takbir. However, male Muslims should recite it in a loud voice, while females should recite it in a low voice. For those going to Haj, they needn’t fast on that day as they have many obligations to fulfill. They must complete the reading of the Kitab, al-Hizbul ‘Azam, also known as the Supreme Daily Dzhikir, a collection of prayers from Qur’an and Hadees, by Mullah Ali Qari. They are to read it from beginning to end. They must not smoke cigarettes and sheesha. They must not engage in frivolous talk, haggling, quarreling, arguing or wrangling. They are to make fervent prayer (do’as/supplication), whilst pleading and weeping, seeking His Favours and Bounties. If they do all these, they will emerge clean. If not, they will emerge (as dirty) as they entered Arafah. (1) Fast. Remember fasting means that your tongue, eyes, and all organs, must fast too, especially your heart. fasting on this day removes the sin of the previous year, and of the year to come. 1000 Suratul Ikhlas, starting from morning and completing the reading before sunset, GrandShaykh Abdullah used to say this. La Ilaha illa Allahu Wah’dahu La Shariqa Lah Lahul Mulk wa Lahul Hamd Yuhyi wa Yumit wa Huwa ala Kulli Shay’in Qadir 100x. SubhanAllah, wal Hamdulilah, wa La Ilaha illallahu, wa Allahu Akbar, wa la Hawla wa la Quwwata illa Billah Al Aliyal Azim, 100x. Selawat (salutations) on the Prophet (saw) 100x to 1000x. You may increase all the above recitations to more than the stated numbers, and weep whilst you supplicate, beseeching Allah to grant you His favours. (3) Make do’a for Ummah of Rasulullah (saw) and for our beloved Shaykh Nazim. Hence one should not be busy shopping, cooking, decorating or partying on this night, it is a Night Allah looks at His Servants and grants their needs. (1) Before going to Eid prayer, it is Sunnah to bathe, brush teeth, wear your best clothes and for men to put on perfume. (2) It is forbidden to fast on this day, but you are not to eat before performing the Eid prayers. Eat only after Eid prayers or after the sacrifice, if you are doing a sacrifice. (3) Given the choice of praying at the mosque or at a Multi Purpose hall, stadium or open space, choose the latter. The Prophet (saw) did not perform Solat Eidul Adha at the Mosque, he held it at the open ground, so it is a Sunnah to do that. (4) Go early for Eid prayers. (5) Women and children are also encouraged to join in the festivities by going to that gathering. Even menstruating women may go, and although they cannot pray, they can listen to the Eid Khutbah. (6) In the Eid prayer, the Khutbah is after the prayer (unlike Friday prayers when the Khutbah is before the prayer). Do not talk during the Khutbah – listen respectfully, as if it were the Prophet (saw) speaking to you from the mimbar. (7) The Eid Solat is a two raka’at prayer. It is identical to any other 2 raka’at prayer except that there are some extra takbirs (Allahu akbar) inserted in each raka’at. 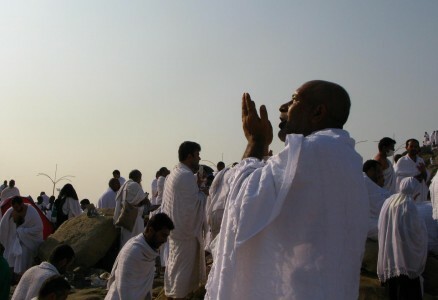 In the first ra’ka’at, between the Takbiratul ihram and Suratul Fatihah, there are 7 additional takbirs. In the second raka’at, before reading Suratul Fatiha, there are 5 additional takbirs. (This is for followers of Mazhab Shafi’e) Intention: I am performing my Solat Sunnat Eidul Adha prayer, 2 raka’at, for the sake of Allah. (8) Return home by a different route from which you came. This is also a Sunnah of the Holy Prophet Muhammad (saw). (9) If you missed the prayer at the mosque because you woke up late, you may pray this Solat Eid at home, on your own. Just make the intention, and pray a two raka’at prayer, remembering to add the 7 extra takbirs in the first raka’at, and the 5 extra takbirs in the second raka’at. The prayer can be done anytime from 15 minutes after sunrise to just before the azan of Solat Zuhur. Once past the azan of Zuhur, the time for the Eid Solat has lapsed. (10) Spend the day in good acts, like zikir, charity, the best good deed of which is to perform Qurban. It is an important Sunnah to perform Qurban every year. (12) Solat al-Khusama can also be done on this day (and also on the day before), preferably between Zuhur prayers and Asar. Taught by Shaykh Abdul Qadir Jilani (q), it is a 4 raka’at prayer, done at one go with one salam at the end. It is done, so that the reward of it is donated to all people whom you have harmed and sinned against, so that Allah will use the reward to satisfy their claims on the Day of Resurrection, if He so wills. (2) Night vigil begins from the eve of 1st Zulhijjah. do the sunnat fasting of Mon/Thurs (should these days fall on Mon/Thurs), alongside your intention to make sunnat fasting of Zulhijjah. (2) Zikir – It is Sunnah to say Takbeer (“Allahu Akbar”), Tahmeed (“Alhamdu Lillaah”), Tahlil (“La ilaha ill-Allah”) and Tasbeeh (“Subhan Allah”) and repentance. Read Quran. (3) Night vigil (each night’s vigil is equivalent to one Lailatul Qadr) . (1) Eid prayer to be done before azan zuhur. (2) Sacrifice (Qurban) should be done after Eid prayers. Once the sacrifice is completed, those who have completed their sacrifice, may cut their nails/hair, if they wish to. (3) It is forbidden to fast on this day. (4) Eid takbir is recited all day, after every fardhu prayer. (5) Solat Sunnat al-Khusama may be performed between zuhur and asar. (1) Sacrifice (Qurban) must be completed by 13th latest. Once the sacrifice is completed, those who have completed their sacrifice may cut their nails/hair, if they wish to. (2) It is forbidden to fast on these 3 days. (3) Eid takbir is recited after fardhu prayers, on all these days till asar of the 13th Zulhijjah. do the sunnat fasting of Mon/Thurs (should these days fall on Mon/Thurs), alongside your intention to perform this sunnat fasting. 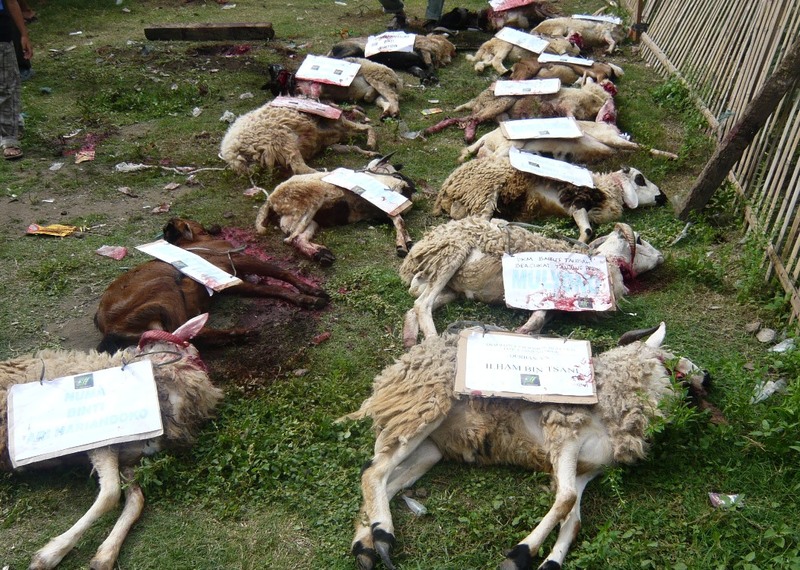 If you need our assistance to arrange Qurban (Sacrifice) for you, drop us an email at admin@SufiHub.com. We have been arranging Qurban in different countries since the 1990s – from as far as Sierra Leone (Africa) and Sri Lanka, to neighbouring Cambodia and Indonesia. This year we are doing it in Multan, Pakistan. Each goat is USD$250 and each part of a cow is USD$200. The meat will be distributed to the needy, orphans and widows by our trusted brother there, a medical doctor by profession. Also, if you are unable to get a copy of al-Hizbul ‘Azam, let us know, we shall try to scan and post it as a pdf file for you to print and download. This entry was posted in Notes and tagged Arafah, Eid, Ten days, Zulhijjah. Bookmark the permalink.